1503 Brighton is a two bedroom, two bath unit that is tastefully furnished. This is a 2 bedroom 2 bath condo. Brand new furniture throughout unit. Flat screen T.V. In the living and Dining area. The master bedroom is equipped with a king size bed. The 2nd bedroom is equipped with 2 full size bed. Large balconies that overlook the Atlantic Ocean. Free wireless internet and plantation phone service. No smoking and No pets. Health and Fitness Club (charges may apply) *Note: PRIVATE owner pools are available to renters of Palmetto Vacation Rentals. 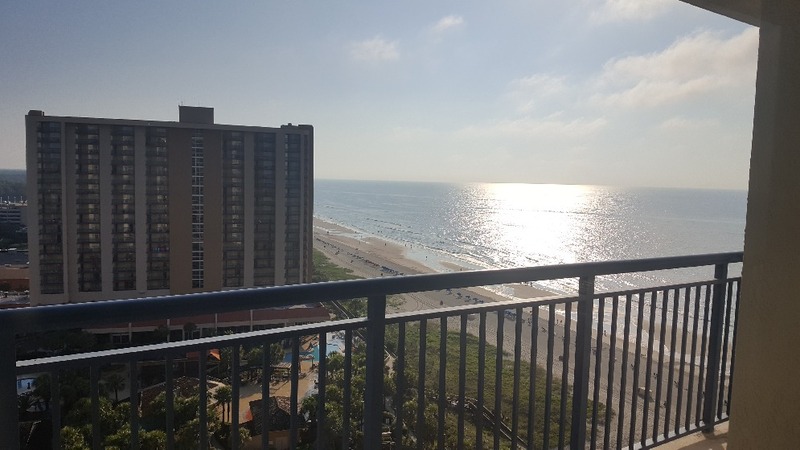 Hilton and Embassy pools, including the sandy bottom pool by the Royale Palms and the Splash Park are not accessible to renters of Palmetto Vacation Rentals. Located on a wonderful 145 acre master planned oceanfront resort community that offers 24 hour security, swimming pools and a Health and sports club. Charges may apply to sports club. Freshwater lakes, rolling wooded terrain, beautiful dunes and a half-mile of secluded beach make the property naturally appealing. First impressions record an immediate feeling of natural beauty and serenity. Surrounded by 145 acres of park-like gardens, woods and lakes, you`ll notice black swans, snowy white egrets and colorful mallard ducks. Here, you and your family can enjoy nature as well as luxurious accommodations and amenities. Please note that the departure clean plus your bed sheets and bathroom towels are included in the final price. Also all beds are made before your arrival. Beautiful, roomy, and great ocean view. Great for a family or friends vacation. On the beach and close to restaurants and shopping when you want to go out, but not in the thick of the crowds. We had more than enough room for 5 adults and 2 small children. "My husband and I stayed here with our two young children, ages 3 and 1. The Kingston Plantation community, Brighton building, the condo and the beach were all very well maintained. The stretch of beach out front is far better than other places we have stayed in Myrtle Beach. The unit was clean and comfortable, and the bedrooms and bathrooms were both very spacious. It's a good size for a single family. The view from the balcony was great, and we got to see some beautiful sunrises. It's very close to the outlet mall and lots of restaurants. Our complaints were very few: none of the doors within the condo locked, and the door to the hall could have been better secured. Our 3 year old is a bit of a Houdini, so a chain or flip bar-type of lock that you see on hotel doors that is out of reach for toddlers would have been nice so we didn't have to worry about early morning escapes. The splash park that is right outside is only available to guests if you book directly through Kingston Plantation / Hilton / Embassy Suites, so if that is something you were hoping to use, you may be disappointed. Overall, we had a nice time and would return to this unit again!" Hello Patrick, Due to the onsite rentals, we do not have access to the Splash Park. Hello my name is Megan. I was wondering if you rent to small 18 year old group?